Leucine is an essential amino acid, meaning that we can only get it from food. Like all amino acids, it’s tougher to get enough of it on a vegan diet than one that includes animal products. But of course it can be done, especially if you know which vegan foods contain the most of it. That’s why I put together a collection of the 30 best vegan leucine-rich whole foods. One thing before we get to that, is how much should you eat per day? The minimum target is 42 mg per kg of bodyweight. For example, I’m 170 lbs (77kg), so that’s 3234 mg, or 3.234 g per day. If you’re an athlete, you’re going to want to aim for even more. I came up with this list by using the food database that the USDA provides, and extracting the nutritional information for over 120 vegan whole foods. The table below is the result when I sort by amount of leucine per typical serving. If you want to know which sources are the most calorie-efficient sources of leucine, go the the second table lower down on the page. If one thing is clear, it’s that legumes are by far the best way to get leucine on a vegan diet. Other than oats, every other food in the top 10 is a legume. Several types of beans, along with lentils and peanuts. Most people, depending on their size, should aim to have at least one serving of each per day. If you don’t mind eating a larger volume of food, you can get your lysine through vegetable sources. This will keep your overall calorie-intake down. The issue is, you’ll have to eat a lot of them. The following table has an additional column that shows you the amount of leucine per 100 calories of each food. This is often more than one serving of a food. The fact that most of the legumes still show up near the top means that they provide a lot of leucine for the calories that they contain. But if you really don’t like legumes, you can stick to the other foods that have risen to the top of the list. In particular, dark leafy greens. Watercress, spinach, bok choy, and kale all provide a good amount of leucine, plus a ton of other nutrients. You’ll have to eat several servings a day to hit the RDA, but it’s possible. There are 2 options if you’re okay with getting leucine through supplements. First, you can buy an l-leucine powder, but it’s hard to find a vegan version of these. There are some, but many are derived from duck feathers. The best one I’ve found that is definitely vegan is NutraBio’s 100 percent Pure L Leucine Vegetable Capsules. Another option is to find a good vegan protein powder that is high in leucine. That means a powder that is primarily made from soy, hemp, or peas, which are all relatively high in leucine as we saw above. 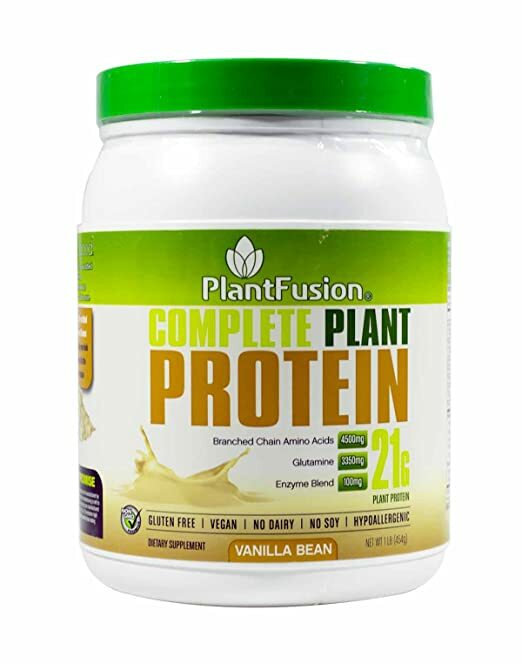 I’ve tried many vegan protein powders, but one is clearly the best in this case: PlantFusion. It has 4,500 mg of added BCAAs per serving. It tastes amazing (seriously, it’s the best tasting of 20+ that I’ve tried). It’s not too pricey either. Why Do We Need Leucine? 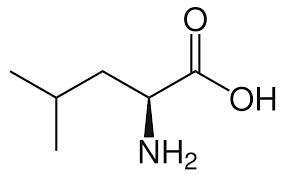 Like any amino acid, leucine is involved in protein synthesis. But leucine is a special, it’s a branched chain amino acid (BCAA), which is suspected be extra important for muscle tissue. There are 2 other BCAAs – isoleucine and valine. If interested, here are the top vegan isoleucine sources, and the best valine sources. 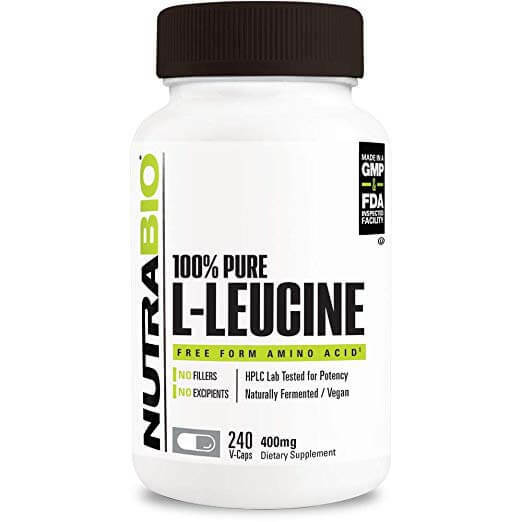 Beyond that, leucine is also involved in controlling blood sugar levels, and in making growth hormone (important for athletes). Leucine is often mentioned on fitness forums because it does a few things that other amino acids don’t. It helps prevent muscle loss, which makes it especially useful during diets. Thanks! Exactly the information I was looking for. Are you kidding? Peas was so low on the list? Are you reading your own article? Don’t appreciate the snark Faith, but to answer your question…(I assume you’re referencing the protein powder recommendation, you weren’t very clear). Peas were low on the list of the best vegan foods for Leucine. They certainly aren’t a bad source of it, and you’re likely going to get leucine from a few sources on this list. Pea protein is a widely available source of protein, and contains a solid serving of peas. In addition, the main reason I like PlantFusion is that there are 4,500 mg of added BCAAs, as I stated above. If these are evenly distributed across the different BCAAs, most people will get about 1/2 their RDA just from the added BCAAs in a scoop of protein powder. Put that together with the pea protein, and it should be really clear why it’s a good vegan choice for a leucine supplement.